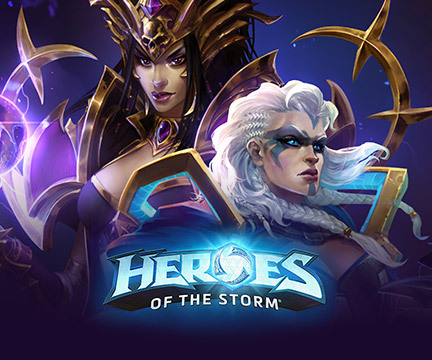 If you haven’t heard, the first expansion for Hearthstone: Heroes of Warcraft will feature the zany, brainy, delightfully surprising chaos that inevitably occurs whenever there’s a contest of wits between Azeroth’s most diminutive denizens: it’s Goblins vs Gnomes! 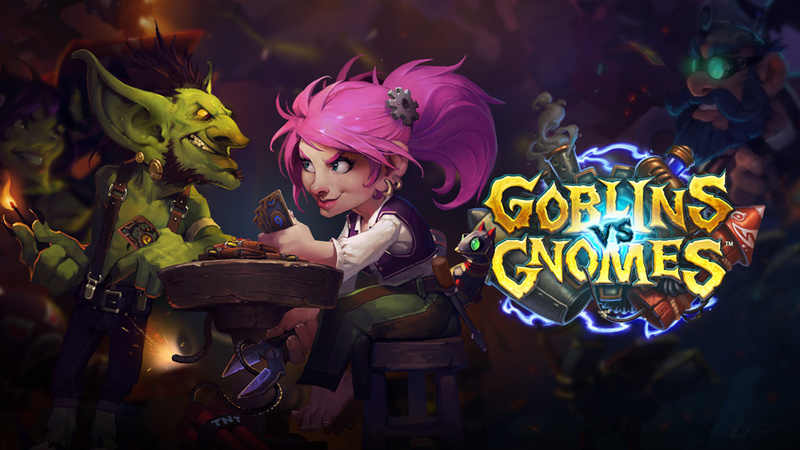 Hearthstone senior game designer Ben Brode, game director Eric Dodds, and senior producer Yong Woo took to the panel stage on Saturday to talk shop about Goblins vs Gnomes, and what we can expect when we get our mitts on the new expansion once it’s released. 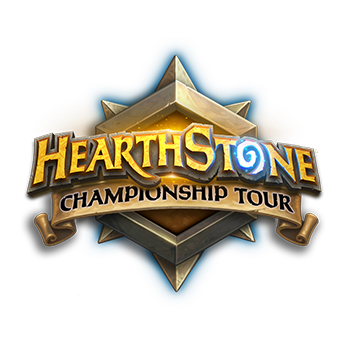 Ben kicked off the panel to discuss Hearthstone’s first year with some interesting stats, ranging from what are the ‘best’ and worst’ cards in Hearthstone, a bit of a post-mortem on Curse of Naxxramas (pun intended), and the role that randomness plays in games (including Hearthstone), which is what we’ll focus on here. 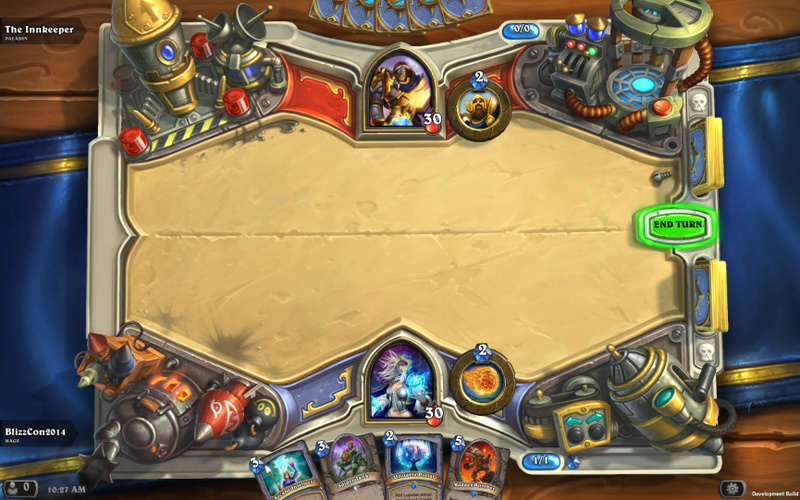 Randomness has been the source of much ire in the Hearthstone community. 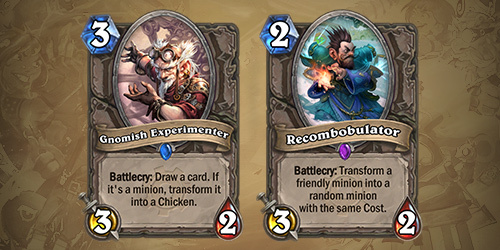 Whether it’s seeing an opponent draw the perfect card at just the right moment to foil our plans, or Tinkmaster Overspark turning an opposing minion into a Devilsaur when we really need a chicken, randomness can be frustrating. We’ve all had a moment when we felt like we played masterfully, only to have victory snatched away by a single moment of bad luck. It’s easy to feel like the existence of any randomness in a game means that skill matters less. Every game you can win or lose falls somewhere on a graph like this. 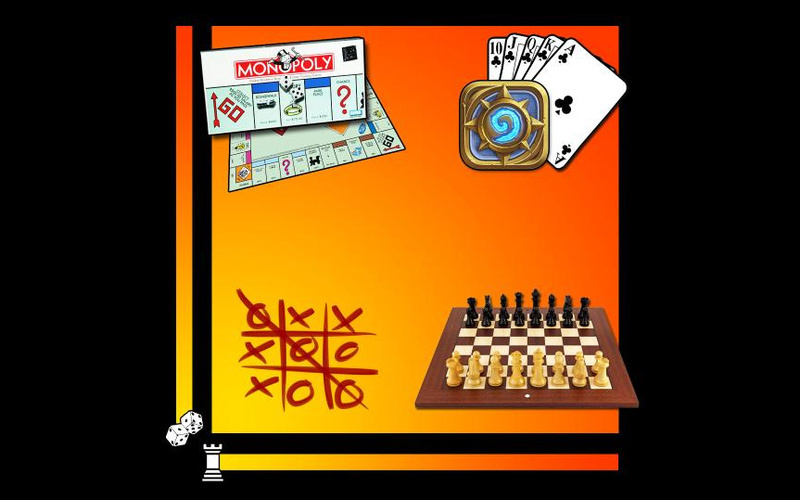 Tic-tac-toe has no randomness, but it also requires almost no skill. There is no Tic-tac-toe world championship, because once you know “the strategy” every game ends in a tie. Some games that are extremely luck-based (like Monopoly) very rarely have moments where you can exercise your superior skill to win. Chess is a classic example of a game that includes a lot of skill and no randomness. 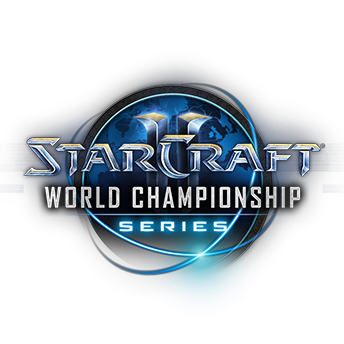 However, at the highest levels games like this often require massive amounts of memorization, since games often play out in the same way. Bobby Fischer, one of the greatest Chess players of all time, actually proposed randomizing the back row of pieces to help solve this problem with high-level Chess! 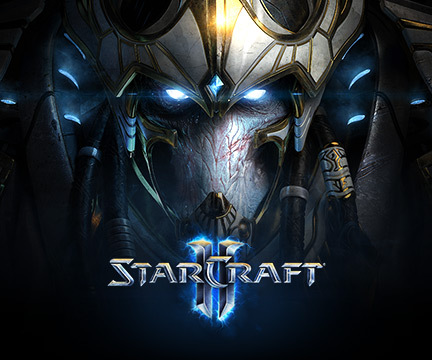 That leaves the games that feature both high randomness and high skill. Games like Poker . 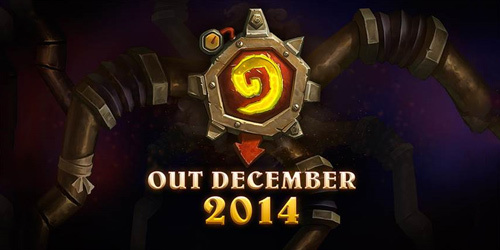 . . and Hearthstone! While any particular hand of Poker is random, the best players still win consistently, and Hearthstone is no different. 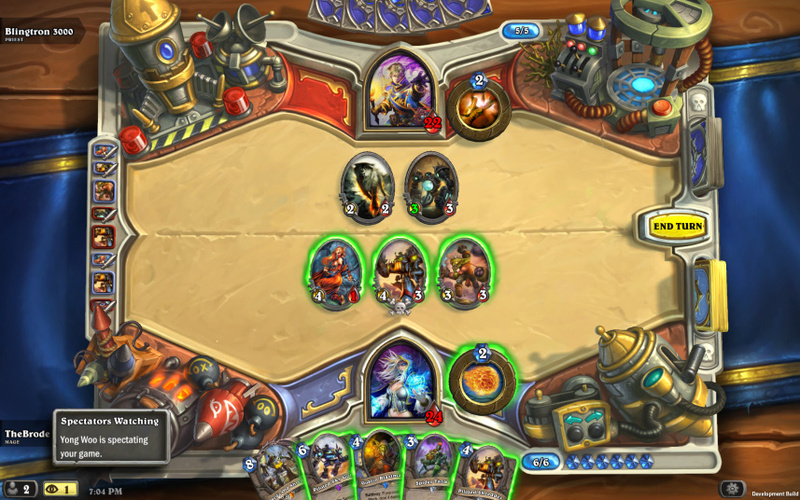 Look at players like Kolento, who place highly in tournaments over and over again. 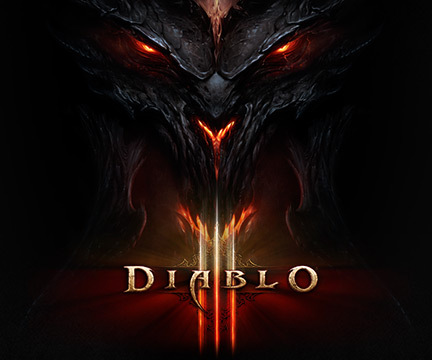 Games in this high-randomness, high-skill category have two really cool attributes. First, you are constantly presented with novel situations. If every game of Hearthstone was like the last, it would be easy to memorize a game plan and just execute it over and over again. 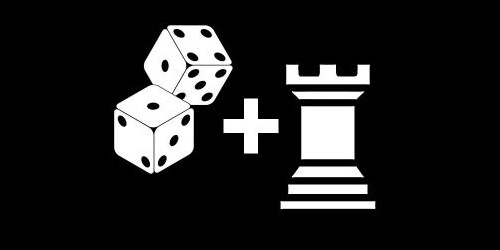 Instead, randomness makes it necessary be quick thinking and solve new problems in every game. A Hearthstone game is more than one turn, and to win consistently, a player must act and react to changing circumstances turn after turn to make the most of what is happening in a match and set up a victory. In this case, randomness actually increases the amount of skill required to perform well, precisely because it can throw a wrench in our plans and forces us to think on our feet. The second great thing about this type of game is the frequency of awesome player stories. When you need one specific minion to win a Brawl or you lose, and BOOM: It all goes down exactly right—your Armorsmith survives and you manage to turn the game around with an incredible play! That’s a great story! Randomness increases the excitement and frequency of these memorable events. This combination of novel scenarios and crazy player stories is a huge part of what makes Hearthstone a TON of fun. Game Director Eric Dodds then took to the stage to talk about the new Hearthstone expansion: Goblins vs Gnomes! That’s right! 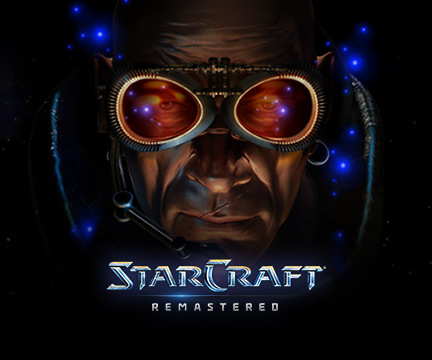 An expansion! Over 120 cards packed with Goblin and Gnomish awesomeness. Need something blown up . . . or transmogrified . . . or flattened by a gigantic, ridiculous, smoke-spewing engine of destruction? You need look no further, the mayhem has arrived! Sounds Great! But Why Goblins vs Gnomes? 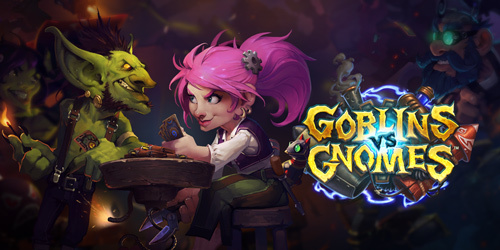 There was definitely some discussion before the Hearthstone team settled on Goblins vs Gnomes for the first expansion. 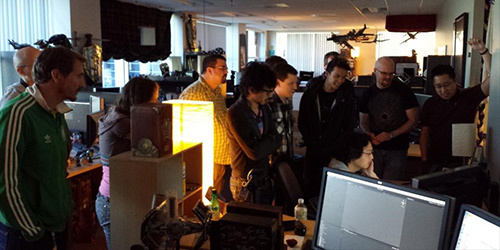 First, the team looked at where Hearthstone had already been. The first Hearthstone Adventure, The Curse of Naxxramas, took place in Kel’thuzad’s dread, dank, and dark necropolis: Naxxramas. The team injected Naxxramas with a healthy dose of snarky fun using a Grobbulus-sized syringe, but at its heart, Naxxramas is still a pretty serious place about creepy undead stuff with a doom-and-gloom theme. 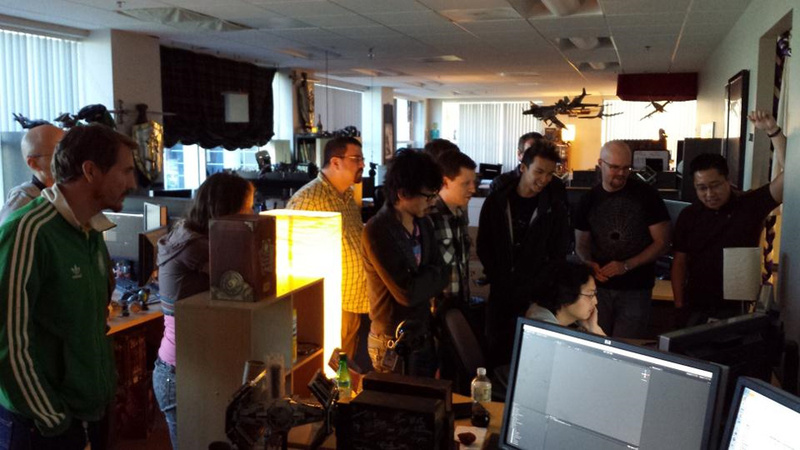 The team wanted to do something very different for the first Hearthstone expansion. Something more light-hearted, colorful, and a little zany. And, as always, it had to be FUN! Goblins and Gnomes are famous for their wonderful inventions, and they also have a unique way of inspiring passion! Some people love them and all that they do. Some people would rather see them all zapped by their own creations. Whether these diminutive demolitionists are your favorite thing and you play them every chance you get, or the pint-sized puntables are your first target for total annihilation, Goblins vs Gnomes has something for everyone! 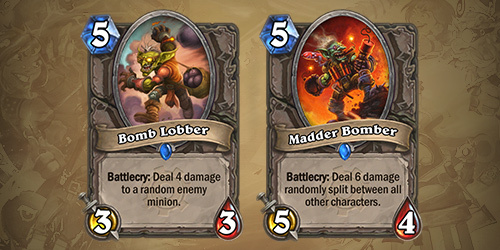 Goblins vs Gnomes cards are packed with crazy creations that will expand player deck options in huge, delightfully surprising ways. Goblins are known for their business acumen and their love of big explosions, and definitely not in that order. At the heart of Goblin engineering lies a deep, overwhelming desire to see things explode. Sure, ideally that means the enemy, but that’s not what you’d call a strict requirement. As long as someone is getting blown up, then your average Goblin will be happy. Conversely, what Gnomes do, they do FOR SCIENCE! 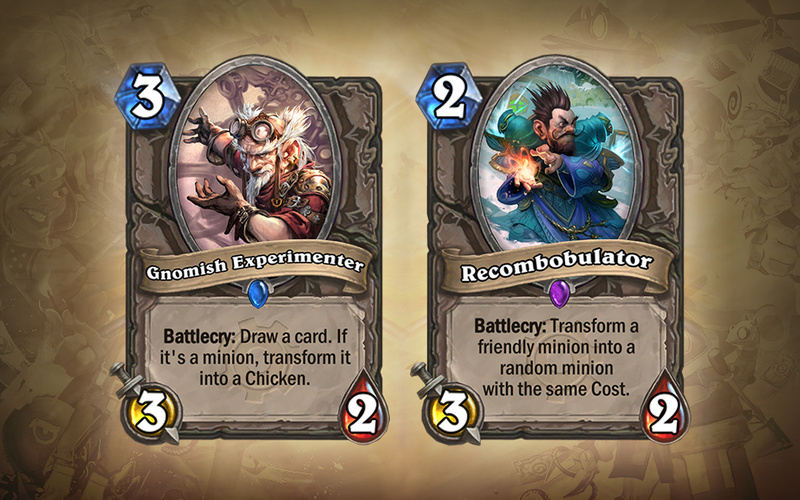 While Gnomish inventions are less likely to leave smoking craters, they are significantly more likely to turn innocent bystanders into poultry. 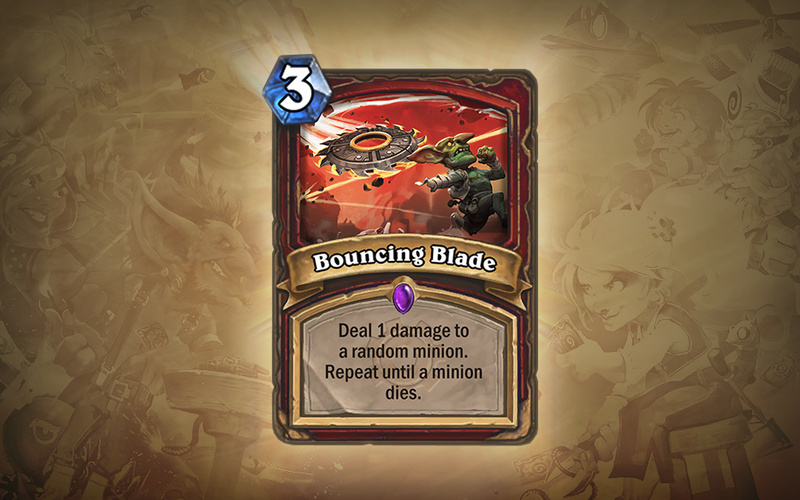 In fact, it seems like a lot of Gnomish engineering is a combination of the wackiest technology imaginable and a hefty dose of ‘turning-things-into-other-things probably-by-accident.’ Odds are, rather than blowing something up, a Gnomish invention will usually just leave the unfortunate target wishing they’d been blown up. 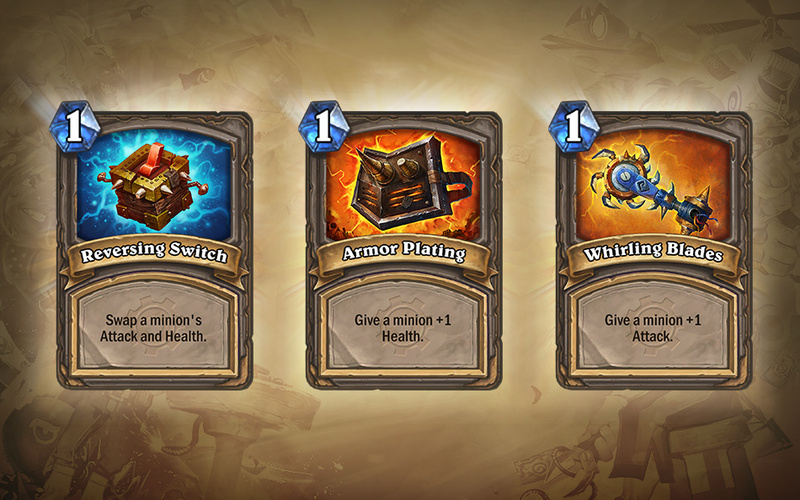 While they’re often at odds, Goblins and Gnomes combined their engineering know-how to crank out a brand new board for Hearthstone: Goblins vs Gnomes. 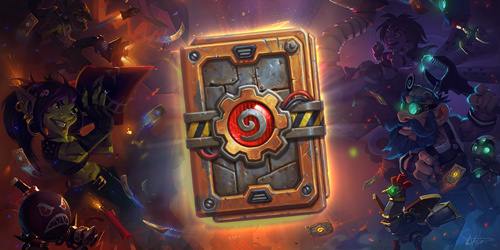 While the technology has proven too disastrously unstable to allow operation at BlizzCon, you can be sure that when Gnomes vs Goblins arrives, the devices scattered around the edges of this board will be working spectacularly in ways that probably bear absolutely no resemblance whatsoever to what was originally intended. While Goblins and Gnomes are at the heart of this particular contest, the real stars of the show are the crazed mechanical creations that they’ve built. 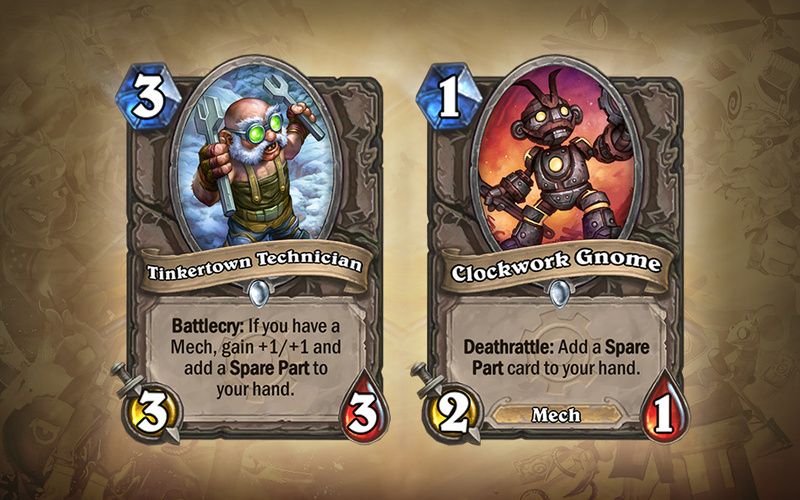 Goblins vs Gnomes brings with it a new mechanical minion type: Mechs. 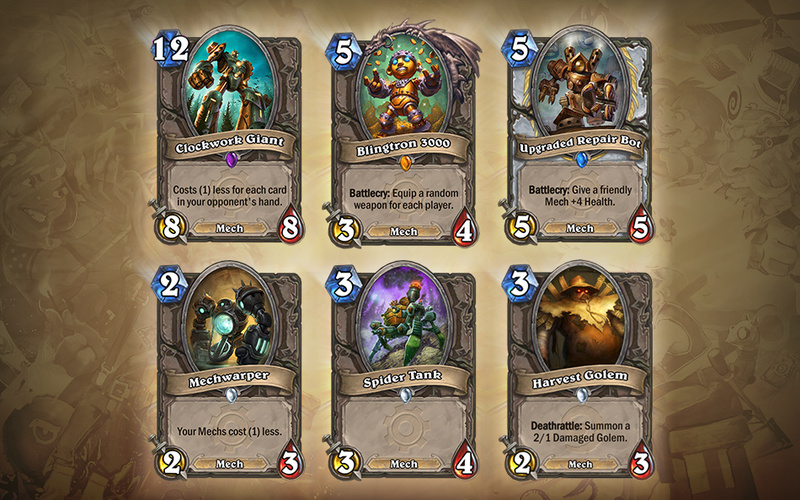 Many of the new cards are Mechs, or interact with Mechs in interesting ways. 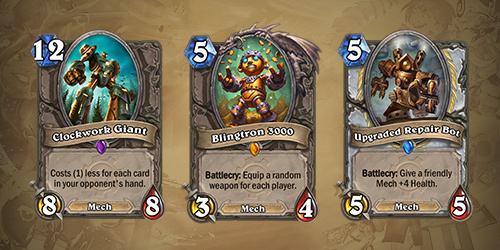 Each class also has its own Mech-based cards that help ensure that making a deck featuring Mechs prominently will be viable, and that they’ll fit well even in non-Mech focused decks. 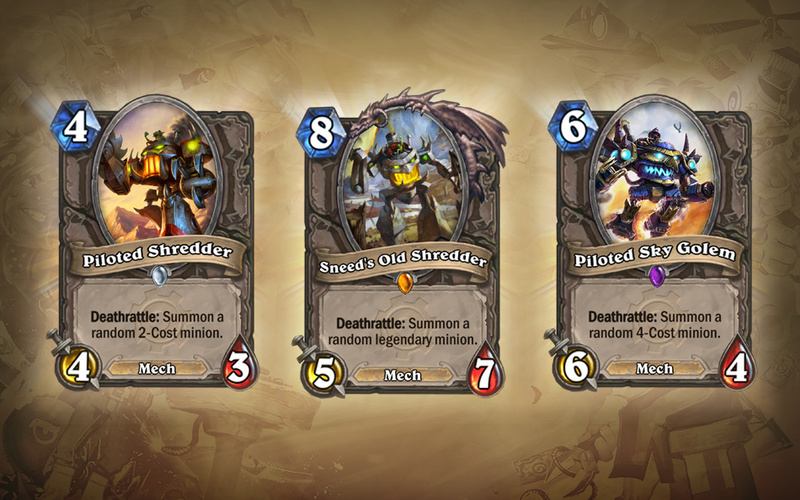 Some old favorites that clearly have been Mechs all along now have a shiny Mech type bolted onto their cards as well. Finally, and possibly most importantly: GIANT ROBOTS! Of course, not all Mechs are automatons. Some Mechs have pilots, and when the Mech is destroyed, the pilot hits the big shiny red eject button, parachutes onto the field, and carries on the fight! 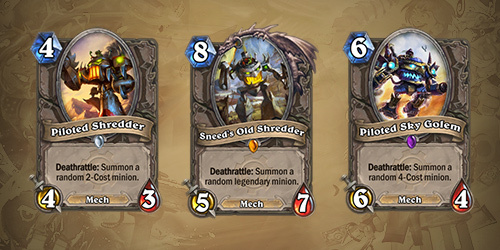 Usually that’s a lower cost minion than the original Mech, but Sneed left his old shredder behind when he was defeated in the Deadmines, and only a Legendary minion could possibly master those controls. Of course, which Legendary minion was in the cockpit varies wildly. 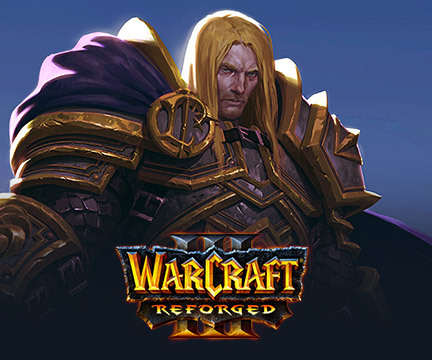 It could be Lorewalker Cho . . . or it could be Ragnaros! Sure, Rags might have some trouble scrunching down into the pilot’s seat, but don’t overthink it. All things are possible WITH SCIENCE! Goblins and Gnomes love tinkering. A thing isn’t good until it’s been bettered with a few engineering “improvements”. 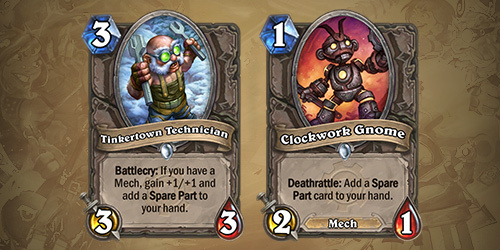 That love of tinkering is reflected in Goblins vs Gnomes with Spare Parts cards. These 1 mana spells are acquired in a variety of ways, and playing those cards lets players improve an existing minion just a little bit, or maybe inconvenience their opponent at a critical moment. 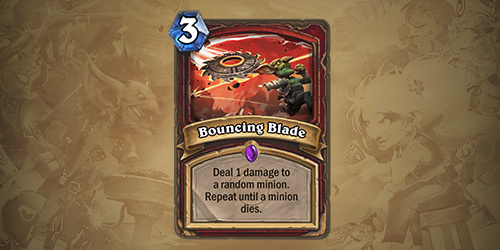 While they can’t be added directly to a deck, a random Spare Part can often be acquired when certain minions join the fray, or are dismantled, leaving useful bits and bobs in the crater where they used to stand. So how do you bolt Goblins vs Gnomes fun onto your collection? 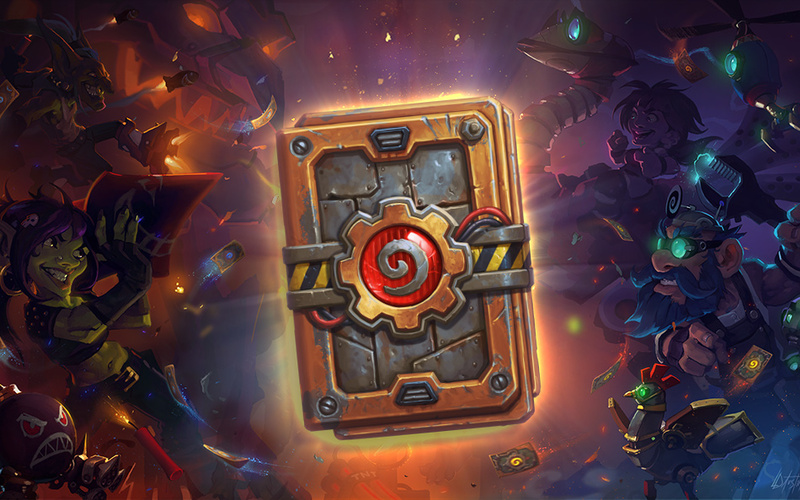 You’ll be able to get Goblins vs Gnomes packs for the same cost (in either gold or real money) as the existing Expert Hearthstone packs. If you’re already sitting on a hefty stockpile of dust, then you’re in luck! 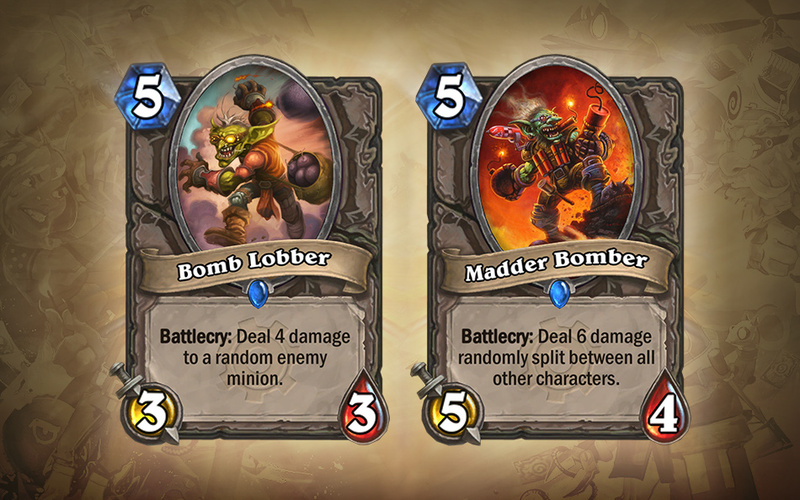 You can also craft Goblins vs Gnomes cards for the same dust costs—based on rarity—as the current cards. 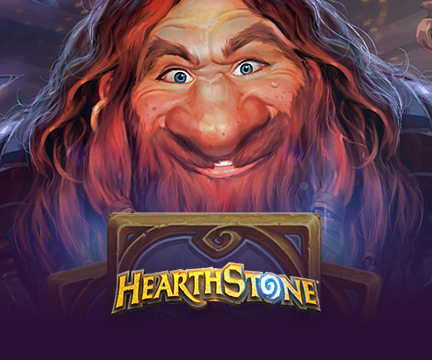 Just wait until you see what happens when you open a Goblins vs Gnome pack! On the subject of seeing, Yong Woo took to the stage to talk about another exciting feature that will be arriving alongside Goblins vs. Gnomes. 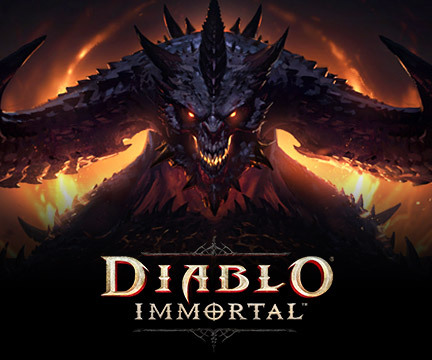 . .
One of the things that we realized early on while working on Hearthstone is that it’s a game that is just as much fun to watch as it is to play! 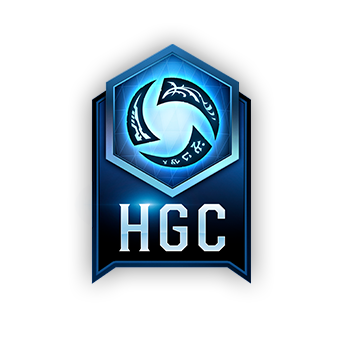 Whenever one of us is in a really good game, the whole team will gather around to watch, talk about Hearthstone, and chat about cards and deck concepts. 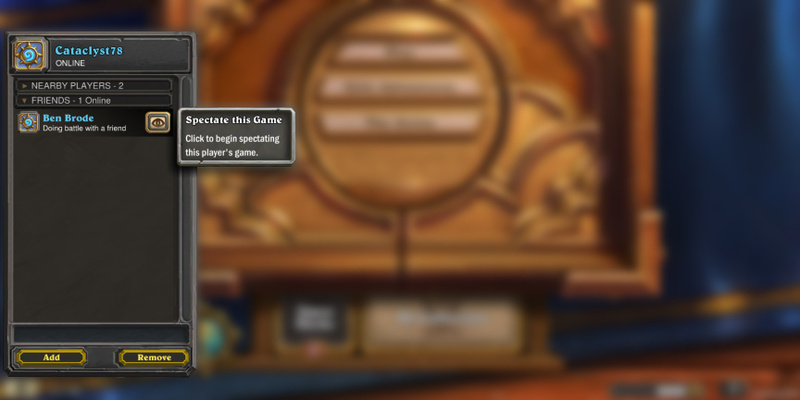 It’s a really great experience, and it’s one of our favorite ways to play Hearthstone: surrounded by friends. It’s also the reason why we’re so excited when Fireside Gatherings bring players together to play face-to-face and hang out. Of course, sometimes your friends can’t be in the same room. Sometimes they’re not even on the same continent! 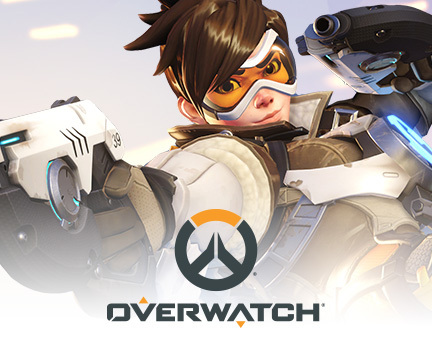 That’s one of the things we love about the Blizzard community: we’re always making friends from around the world. With that in mind, we’ve been working hard on another feature. 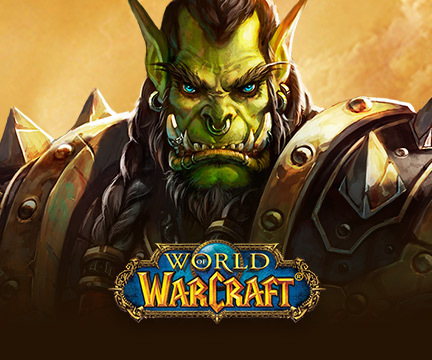 It might be the number one most requested feature since the release of Hearthstone. . .
That’s right! 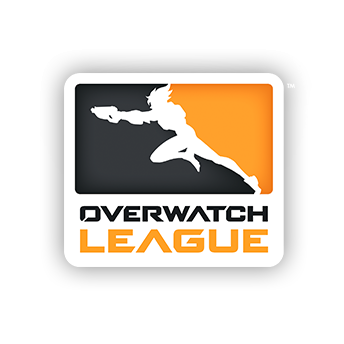 We’ve been working to make Spectator Mode a reality. 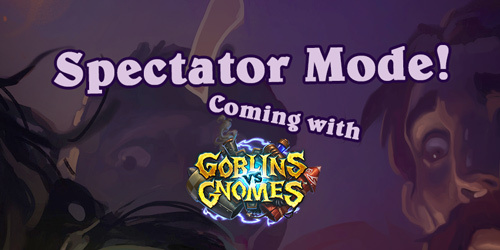 You will soon be able to watch your friend’s games as if they were sitting right next to you when the explosives start flying in Goblins vs Gnomes! After Goblins vs Gnomes comes out, when you bring up your Friends list, you’ll see a new Spectate button next to your friends who are playing games. 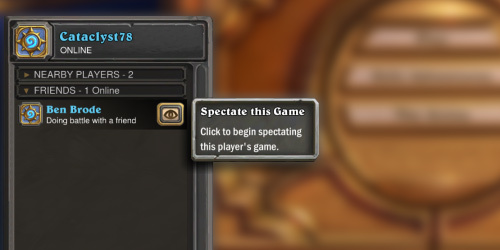 We wanted to make using Spectator Mode as easy as walking behind your friend’s computer, so watching their game is as simple as clicking the Spectate button! 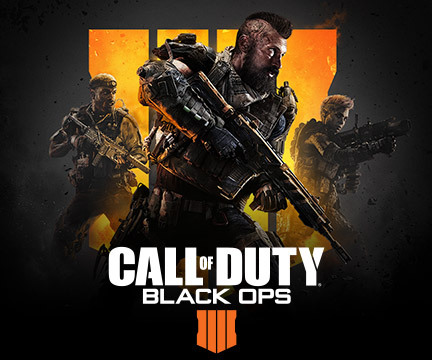 Once you’re watching your friend’s game, it’s almost as though you’re sitting in front of their computer. You can watch them hover over their cards and minions as they ponder their next move. You can see them point their targeting arrow and follow along with their thought process. 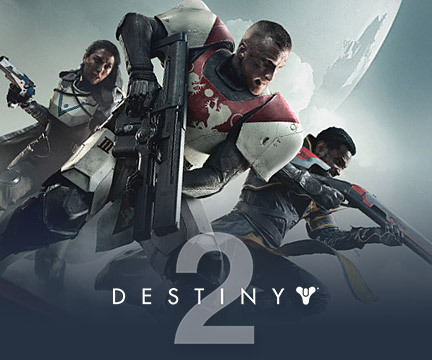 You can even see the emotes the players are using. 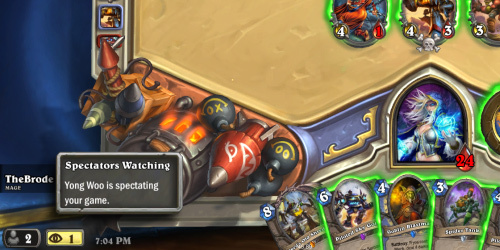 It really feels as though you’re playing the game, but there’s a Spectator Mode indicator on the bottom-left corner to remind you that you’re just watching, so no matter how badly you might want to, you can’t take over when your friend misses lethal! On the other hand, as a spectator, you have full control over what you’re looking at. 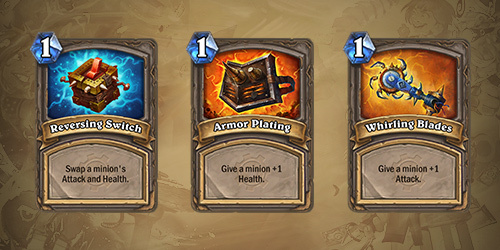 As the game progresses, you can hover over cards and minions to get full card text and the details on buffs, and you can also check out the history to see what happened before you started watching! When someone is spectating your game, you’ll see an indicator on the bottom left to let you know that you’ve got company. It will show you how many of your friends are watching, and who they are. And of course, if you’d rather not have spectators, you can set Spectator Mode to invitation only, and even ‘kick’ unwanted spectators from your game. 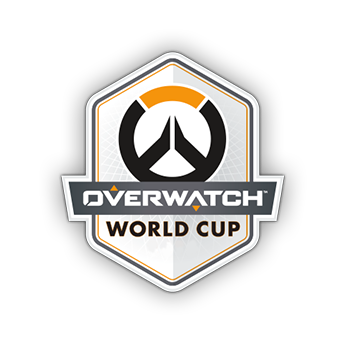 We’ve received a lot of requests for a good way to cast a match between two players without having to stitch together multiple streams, so we also wanted Spectator Mode to be useful for casting tournaments. So, Spectator Mode will support spectating two players at the same time. 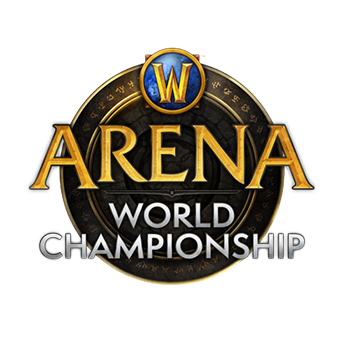 You’ll be able to view both players’ hands, and casters will be able to keep tabs on both players from within a single Hearthstone client. That’s All. . . For Now! That’s all these Hearthstone heroes had for us at BlizzCon, but you can be sure that there’s more exciting Goblins vs. Gnomes gnews coming before its release this December, so keep your goggles soot-free and keep those transmitters pointed in this direction to stay tuned!